◎ Chinese astrologists from Hong Kong note that the exploding meteor is an ill-omen for Jiang Zemin. 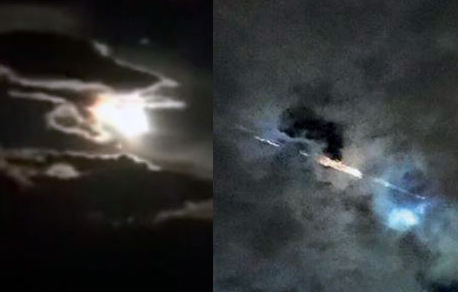 On the evening of Oct. 4, a meteor exploded over Shangri-La County, Yunnan Province. According to NASA, the fireball exploded with the force of 540 tons of TNT. Chinese astrologists from Hong Kong note that the event is an ill-omen for former Chinese Communist Party (CCP) leader Jiang Zemin. Falling meteors: Historically in China, falling meteors signals significant changes. Incidentally, meteors sightings often preceded the deaths of notable CCP figures. 1971: Meteor showers were observed in Shuangyang County, Jilin Province. On Sept. 13, CCP no. 2 Lin Biao perished in a plane crash in Mongolia. 1976, March 8: A “large fireball” was observed in Jilin Province and a 4-ton meteorite was later recovered. Three powerful CCP leaders, Mao Zedong, Zhou Enlai, and Zhu De, died that year. In October, Hua Guofeng carried out a successful coup in Zhongnanhai. 1997, Feb. 15: Meteor showers fell over Juancheng County, Shandong Province. Deng Xiaoping’s death was announced four days later. Politburo member Sun Zhengcai was purged in July, while top generals Fang Fenghui and Zhang Yang were removed from their respective office in August. In September, Xi dispatched four discipline inspection teams to probe high-ranking military officials. The inspection tour is scheduled to end three days before the 19th Congress. Our take: Based on our analysis, SinoInsider believes that Xi recently foiled a Jiang faction coup. Thus should the Jiang faction continue to menace Xi, Xi could possibly arrest Jiang and air his crimes. If Xi takes this step, he will win immense popular support, and China’s history could be rewritten.